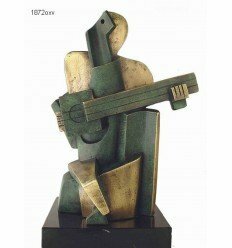 Buysculpture offers you with a great variety of bronze sculptures with different finished, the oxidized green bronze included. The green finish creates a monument-like aura around the piece, it adds the sense of time and pride to the sculpture. 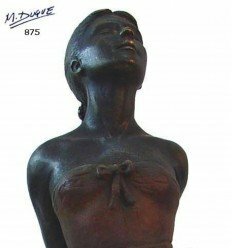 Buysculpture offers you with a great variety of bronze sculptures with different finished, the oxidised green bronze included. 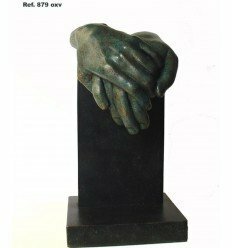 The sculptures of this finish are made with a layer of bronze on cold smelting copper, with base of graphite and limestone, and given polished and oxidised finish. The same effect we usually see on ancient statues placed at old plazas and buildings. The sculptures of green bronze finish perfectly reflect the passage of time on their surface and uniquely captivate attention of everyone who contemplates their beauty. 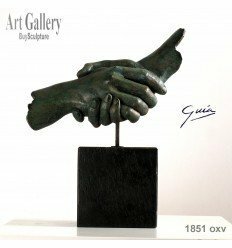 At BuySculpture we offer sculptures with oxidised green bronze finish designed and created by European sculptors of worldwide renown and prestige. 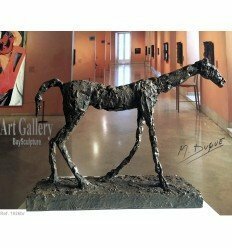 Our group of sculptors designs and creates unique pieces to the delight of us all, giving us the opportunity to acquire the best quality works of art. They put the utmost care and importance to craft absolutely perfect reproductions, and they focus on both the artistic aspects and materials. By the use of quality materials they achieve faithful reproductions of each piece of art and give them perfect finishes. 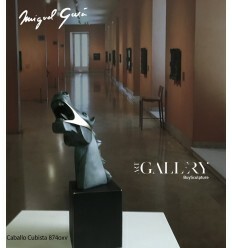 They can also create artworks per individual orders to craft personalised piece, for example upon request of an organisation a piece of art to be given as a prize, etc ..
On the other hand, you can also purchase at our art gallery, reproductions of classic works made with special care by our sculptors. Each piece shaped precisely to the smallest characteristic detail of the original. 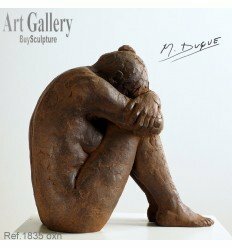 However, at Buysculpture, you can also find reinterpretations of renowned level given a personal touch by our artists via their artistic vision of the work turning it into an original and amazing piece of more current style. 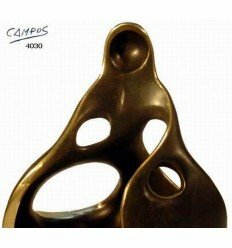 The technique of bronze casting is known to man since the Bronze Age, 3500 years a.d.. Many ancient civilisations crated statuettes as offerings to the gods, mostly small in size and crated in bronze, which in turn resulted in preservation of many of these art pieces in good condition to be now seen all over the world in museums. The first to create sculptures in bonze of life-size were the Egyptians and Greeks. Nowadays, we encounter bronze sculptures in variety of size, styles and finishes; including the green bonze. The traditional bronze funding is a long and labor-extensive process, but it lends excellent effect and amazing precision. Sadly, the costs of it are extremely high. Due to it, and to make the sculptures more obtainable, our artists work with layer of bronze over a cold smelting of copper as already indicated. A work that is noticeable in the obtained results, where beauty of each piece is unique. In the case of green oxidised bronze finish, they succeed in providing each sculpture with a very elegant and unique touch. The artist begin working on a piece of clay, wood or plaster, whichever seems more appropriate for the piece he plans to create. This replica is then treated with different materials and coated with a silicone rubber to yield a mold, which then is to be filled with hot wax obtaining a wax replica of the intended work. The wax version is flowingly bathed in a ceramic to cover it completely, and then subjected to a process for removing wax from the interior with hot steam. As a result we are left with yet another replica of the final sculpture, but in this case it is hollow ceramic shell, which will serve as a template for the final version. This final version is then filled with molten bronze. All that is left to do is to break the ceramic covering the sculpture, and the artwork is revealed in all its beauty. Polishing and providing it with desired patina results in simple splendour. Once the work in bronze and desired finish are done, the artist proceeds to treat sculpture with the patina to create the desired green hue. This last step will give the sculpture its final and distinctive touch, and is where the artist will increase efforts to make his vision an embodied perfection. The green patina gives the sculpture that old look, distinctive and full of elegance. At our art gallery you are able to acquire sculptures of green oxidised bronze to give as a valued gift as well as for your pleasure. Oxidised green bronze finish, a perfect detail. Offer one of our sculptures with oxidised green bronze finish as a gift and you will be giving a really special gift. They are perfect as corporate, but also as a personal gifts for all the unique celebrations and important events such as wedding, anniversary, etc. Furthermore, as already mentioned, the artworks are ideal as a rewards in competition or recognition of lifetime achievements. Enjoy the view of a oxidised green sculpture in bronze, treat yourself and enjoy a wonderful work of art by worldwide renowned sculptors. The elegance of green bronze added to your home or office will fill the space with a touch of originality and authenticity. The pieces of art acquired in our gallery will always be accompanied by a certificate of originality and copyright numbered. Both add value to the work, which with time will only increase. Also, should you purchase the piece as a gift, the certificate to compliment the piece will further increase the significance to the person receiving it. 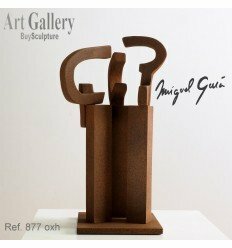 BuySculpture is your trusted art gallery where you find the most current works and the most original designs on the market.